MACON, Ill. – Grab a race bucket before the Bud Light Ladies Night race when the gals from Woody’s hop into four-cylinder hornets for a five-lap shootout Saturday during Heinkel’s Three Dog Night at legendary Macon Speedway. Just like last week, fans can buy race buckets filled with ice and five beers. 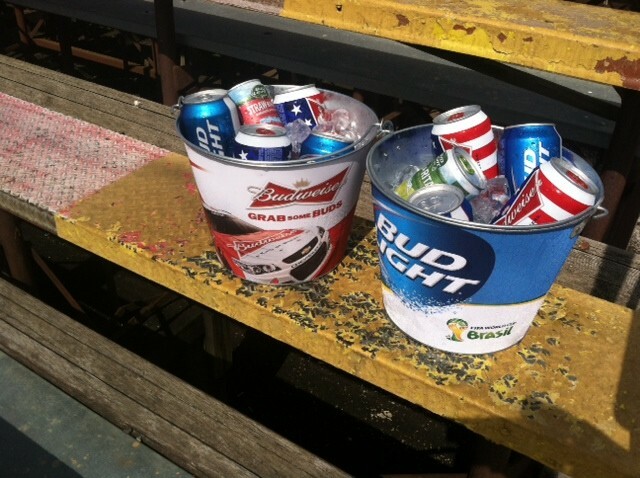 In conjunction with the Bud Light Ladies Night race, fans may choose from Bud and Bud Light buckets. Pick your favorite bucket. Fill it up with five beers from the Budweiser line of products, let the free ice chill it down and take a seat for some hot racing. For just $20, you get the souvenir race bucket, five cans of beer and the ice. Refills are $15 for five more cans and ice to keep it cold. So get to Macon Speedway and get your souvenir race bucket. They come in three styles – galvanized Bud Light, Budweiser racing with Kevin Harvick and Bud Light with the World Cup logo. Don’t be late. This deal is only while supplies last. Race buckets on racing on the high banks. You can’t beat that. In addition to the Bud Light Ladies Night race, Macon Speedway will also race Big Ten Series Street Stocks, Billingsley Towing Modifieds, Sportsman, Outlaw Hornets, Stock Hornets, Beach House Mini-Sprints and Illinois Lightning Sprint Series. Tickets are $15. Women receive half-priced admission on Bud Light Ladies Night. Gates open at 5 p.m. with racing at 7.